Monumental and yet grippingly intimate, Bach’s St Matthew Passion tells the story of Christ’s last days with music of aching beauty, that speaks of heartrending sorrow and timeless hope. Sung in German. We’re delighted to return to the St John’s Smith Square Holy Week Festival in London. 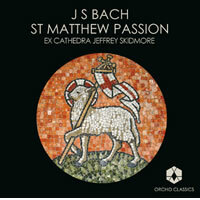 Listen to excerpts and buy our CD of Bach’s St Matthew Passion (sung in English) here. £35 / £28 / £22 / £14 plus a booking fee of £2.75 by phone, £1.75 online. Book online via the link above, or call the SJSS box office on 020 7222 1061. – Bach St Matthew Passion at Symphony Hall on Good Friday, 19 April 2019.